Line an 8x8 baking dish with foil, leaving a 1 inch overhang. Spray with non-stick cooking spray. To prepare the cookie dough, beat together the butter and sugar until light and fluffy, about 3 minutes. Beat in the vanilla, salt, and half and half. Stir in the flour until incorporated. Set aside. To make the fudge base, combine the brown sugar, butter, salt, and half and half in a saucepan. Stir over medium low heat until the butter has melted and the brown sugar is dissolved. Remove from the heat and slowly stir in the powdered sugar, 1 cup at a time, until the mixture is smooth and well combined. Stir in the vanilla. 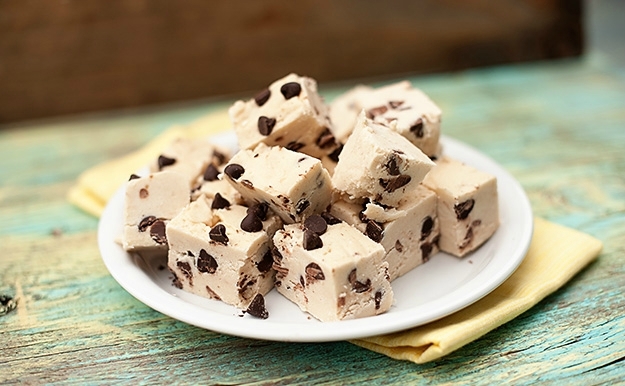 Add the cookie dough to the fudge base and stir to combine. Mix in the chocolate chips. Spread the mixture in the prepared baking dish. Chill until set, at least 3 hours. Keep in refrigerator for up to 1 week.